I recently sent a message to the son of a deceased friend and was about to mention what a great man I thought his father had been. I caught myself before I phrased it that way. I realised that in the Christian life, there is no past tense. There are events in the past, but the life remains. I suppose that if I thought my friend had been good at one point in time and had ceased to be good later, I could say that he was a good man. The man remains. Even while the body is in repose, temporarily going back to the earth from whence it came, the man remains. As Orthodox Christians we are reminded of this when we venerate the saints through their icons, though when talking of the saints, I lapse into the past tense: who was St Athanasius or who was St Paul. When I teach about Jesus in school, I am very vigilant to always speak of Him in the present tense, because I want the kids to understand that Easter happened after Good Friday. And since we pray to Jesus, we have a habit of speech that constantly recognises Him in the present tense. But it is not just those glorified heroes of the Faith that are still alive with Jesus. To be absent from the body is to be present with the Lord. (We can discuss various Catholic and Orthodox theories about how instantaneous this is, but it still is.) Likewise, the disembodied soul in the presence of the Lord is but a temporary arrangement. God only has a present tense. He revealed it to Moses. He revealed it in Jesus. Though we are created beings and have a beginning, as we are knitted together in our mother’s womb, once created in God’s image we share in his eternity. When we live in communion with Him, we share that eternity with Him. As Jesus told the Sadducees, God is not the God of the dead, but of the living. Jesus’ Resurrection was the down payment to guarantee our own. My friend Mark has been away from his body for a number of years now. God took him quite suddenly and quite young. Because he trained me to be an Emergency Care Attendant and an ambulance driver, I still think about him every time I use my cut-through-anything EMT shears. There will be a time when EMT shears won’t be needed, but for now they remind me that there is a time after time when those who have gone before and those of us who will go sometime hereafter (for death comes to all men) will rejoice in the presence of God together in the new creation. Last night I finished N. T. Wright’s Surprised by Hope: Rethinking Heaven, the Resurrection, and the Mission of the Church. When I was writing the blog entry Joe Klein, Rick Warren, and Heaven I came across a review of the book and it piqued my curiosity. Based on my reading of Wright, I realised that I had fallen into the same misconception as Joe Klein. Both Klein and I were writing from the presumption that dying and going to heaven (or not) is for eternity. It’s not that the New Testament teaches this, but only that it has become presumed in much of Western Christianity, from which I built my theology and Klein has used as his straw man. Wright demonstrates that the New Testament is much more concerned with the Resurrection. He emphasises the centrality of Jesus’ Resurrection (having long been one of the most vocal scholars in the battle against liberalism and the mythologising of Gospel) and clarifies how death is simply the way station on the on the road to our own resurrections. As an Orthodox Christian, I don’t entirely agree with Wright’s view of the saints in heaven, but it is closer than most Protestant perspectives. He is mostly concerned with distinguishing his view from the Roman Church. At times he refers to ideas that have been preserved in Orthodoxy and lost in the West. In the last part of the book, Wright explains how he sees this theology of the Resurrection as it affects the role of the Church today. While Wright eschews the liberalism of the Social Gospel, as an American Christian, I have not had the same view as Wright regarding the role of the State, particularly in the welfare of the individual or in the intervention with business or the free market in effecting social justice. Unlike some Amazon (and other online retailer) reviewers, I don’t think that this makes Wright a neo-Marxist or neo-socialist. Rather, I think those reviews substantiate Wright’s view that conservative Christians in the US have tied conservative theology and conservative economics so closely together that to challenge any assumption of the latter is to lose any credentials as a proponent of the former. I think it is good that Bishop of Durham and highest ranking evangelical in the Church of England has challenged some of the presumptions of evangelical American Christianity. Most Americans get very defensive about any challenge to anything American, especially by Europeans. This may be because most European challenges to most things American are based in nonsense rather than good theology. Tom Wright is not talking nonsense. This is not wishy-washy Emerging Church neo-liberal evangelicalism. This is a book which focuses first on personal and cosmic eschatology. It is not a pop-theology revelation of The Revelation. It is a look at what the New Testament and the early Church viewed as the hope for the Christian, the essence of the Gospel. Wright’s view is that if we are hoping for life after death we are too short-sighted. We have to re-focus on life after life after death and this will change the way we look at ourselves and our place in the world. This is one of the best books I’ve read in a while. Every chapter in it is almost worth the entire price. It is so good that I have ordered copies of it for a couple of friends. Even though I haven’t ordered a copy for you, you need to go out and get it anyway. Today is the feast of my name saint, David of Wales. It seredipitously works out that it falls on a Saturday so we get to have Liturgy here in our neck of the woods. 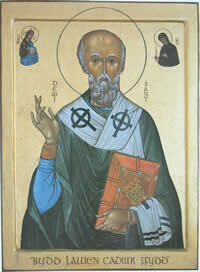 Even though St David is my name saint, I’ve always felt a stronger affinity to his predecessor as archbishop, Dyfrig. This is for various historical reasons as well as the fact that he is from just a few miles away and places associated with his can be visited at any time. That hasn’t prevented me from making two pilgrimages to St David’s or using water from St Non’s Well (located at David’s birthplace) in the baptism of our oldest child, who also has David as a middle name. The disappointing thing for me is that both Dyfrig and David were known for their ascetical life. This is something I hardly aspire to, not to mention ever achieve. St David of Wales, pray to God for us! At Liturgy today we picked up something for which we had been waiting two years. That’s how long it takes to get to the front of the queue for an Aidan Hart original. I can’t get our scanner to work, so I had to take a photo with the digital camera, so the gold is too bright and even washes out some of the blue. The resulting fuzziness does not do any justice to the strikingly sharp colours. I tried it without the flash, but the ambient lighting wasn’t good enough. Having never owned a hand-painted icon, I didn’t know that it shouldn’t be directly kissed for a year. It needs to harden during this time, after which it can be sealed. Before this time any oils, including those acquired from kissing, may damage it. It should be kept in a glass-fronted frame for proper veneration in the meantime. The Abigail icon is original in more than just being hand-painted. 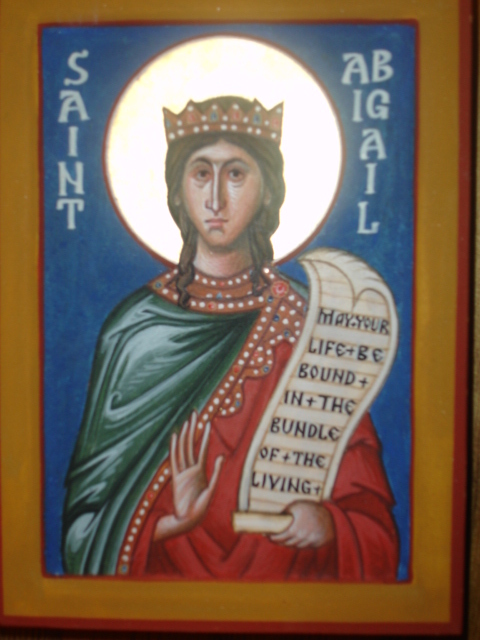 We looked high and low for an Abigail icon before we commissioned this one in 2005. Elizabeth found one on the web last year, but I don’t know the source. Ours is not sourced on any other version – it is writted solely on the inspiration given to the iconographer. Not only is this an extraordinary blessing, but perhaps it is a family story her step-son Solomon had in mind when he wrote, “A soft answer turns away wrath, but a harsh word stirs up anger.” It is difficult to be vengeful while you are being blessed. Born just after the First Council of Nicea in 325 and reposing two years before the First Council of Constantinople in 381 (otherwise known as the First and Second Ecumenical Councils), one man is more responsible than any other for the key changes to the Creed ratified at the latter. Our father among the saints Basil of Caesarea – Basil the Great – helped us understand the nature and work of the Holy Spirit. We are compelled to advance in our conceptions to the highest, and to think of an intelligent essence, in power infinite, in magnitude unlimited, unmeasured by times or ages, generous of Its good gifts, to whom turn all things needing sanctification, after whom reach all things that live in virtue, as being watered by Its inspiration and helped on toward their natural and proper end; perfecting all other things, but Itself in nothing lacking; living not as needing restoration, but as Supplier of life; not growing by additions; but straightway full, self-established, omnipresent, origin of sanctification, light perceptible to the mind, supplying, as it were, through Itself, illumination to every faculty in the search for truth; by nature unapproachable, apprehended by reason of goodness, filling all things with Its power, but communicated only to the worthy; not shared in one measure, but distributing Its energy according to “the proportion of faith;” in essence simple, in powers various, wholly present in each and being wholly everywhere; impassively divided, shared without loss of ceasing to be entire, after the likeness of the sunbeam, whose kindly light falls on him who enjoys it as though it shone for him alone, yet illumines land and sea and mingles with the air. So, too, is the Spirit to every one who receives it, as though given to him alone, and yet It sends forth grace sufficient and full for all mankind, and is enjoyed by all who share It, according to the capacity, not of Its power, but of their nature. In other words, we can have as much of the Holy Spirit as we can handle. It is easy to forget that Christmas is about death. The Father sent the Son to give His life. If we pay attention the other commemorations during the extended Christmas feast this is made more evident to us. The West celebrates the feast of St Stephen the Protomartyr today. The East celebrates it tomorrow. It didn’t take long after the death and resurrection of Jesus to find out that following Jesus meant following him in death to self, and often not just in an ascetical way. There are folk out there who really, really don’t like the Gospel. Start telling the truth and they start getting very angry. On the 28th the West celebrate the Holy Innocents. The East celebrates them on the 29th. They could be considered the real proto-martyrs. From His birth, Jesus challenged the ultimate authority of the State. The Holy Innocents were martyred because there was another King of the Jews. As rosebuds in a whirling storm . . . The sword that pierced the mothers’ hearts. In the East, each of the five days after today’s Synaxsis of the Theotokos commemorates martyrs. Between St Stephen and the Holy Innocents are the 20,000 martyred at Nicomedia in 302 under Emperor Maximian. On the 30th, the Church remembers the martyr Anysia. The purpose of the Nativity is the Passion and Pascha. When we born into the family of God, we are exhorted that we must take up our own cross daily. The days of the festal period should also remind us of those who suffer daily hardship and martyrdom for the sake of the Gospel.